This study/article (1) is a very interesting insight into how the traumatised brain may be “healed” as the result of EMDR therapy. “Post-traumatic conditions lead to derangement of memory and mood regulation possibly ending with a fear-driven response elicited by internal or external cues associated with a traumatic situation . Recent studies have probed into EMDR’s mechanism of action and its physiological and neurobiological substrate – providing some preliminary evidence of an association between functional changes and treatment efficacy. However, none of these studies succeeded in investigating real-time firing of brain neurons in response to the external stimuli induced by EMDR since the effects of therapy on brain activation/deactivation were only recorded before and after EMDR treatment. This has restricted the reported information to static conditions not describing in detail the dynamics of regional neuronal synchronization during EMDR sessions. Ten psychologically traumatised symptomatic patients were included in the study (mean age 33±10; 4 males, 6 females). Patients were referred to clinicians specialized in EMDR treatment (AV, GL, RR, IF) on the basis of the presence of major psychological trauma. Although all patients were clinically diagnosed as suffering from PTSD, due to logistics and patients’ refusal to long and elaborate procedures, no categorical diagnosis could be made according to DSM-IV-TR criteria. Traumas consisted in sexual abuse (5), grief and loss trauma (3), abortion related trauma (1) and severe physical abuse (1) and EMDR sessions focused on these specific life events. Ten healthy subjects comparable for age and gender (mean age 37±7; 5 males, 5 females) and aware of the study agreed to participate and to act as controls of their own free will. In all of them the index trauma chosen was the one with the highest impact on their memories. The major distinction between patients and controls was the lack of trauma-related symptoms in the latter group. At the beginning of EMDR sessions patients and controls were asked to focus on the primary elements of the traumatic memories while at the same time following a “dual stimulation” using bilateral ocular stimulation (BS) lasting usually 30 seconds and entailing about 30 complete horizontal left-right-left eye movements each. Progressive changes after BS sets reflect reprocessing of the memory, until patients are able to engage in the recollection of the event with no disturbing emotions and with positive and constructive perspectives about themselves, showing desensitization and experience adaptive resolution. Once the memory of the traumatic event has been reprocessed, the EMDR protocol is applied to recent triggers and to future anxiety provoking or avoidance situations. Treatment will be completed as soon as past, present and future trauma-related issues are addressed. Treatment completion is usually associated with post-traumatic symptoms reduction. Phase one is devoted to history taking. During phase one the clinician assesses symptoms and makes a diagnosis. At this time the patients’ readiness for EMDR is evaluated and a treatment plan is carried out. Patients along with the therapist identify possible EMDR processing targets. During phase two the therapist ensures that patients are provided with adequate resources for handling emotional distress and good coping skills. Patients are then prepared to start processing traumatic material, by explaining the method and showing BS, while focusing on a positive memory (safe place exercise). From phase 3 through 6, a target is identified and processed using the EMDR protocol. These phases involve patients identification of the most vivid visual image related to the memory (if available), a positive and a negative belief about the self, related emotions and body sensations. In the desensitization phase (Phase 4) patients are instructed to focus on the image, negative belief and body sensations while simultaneously moving their eyes back and forth following the therapist’s fingers as they move across their field of vision for 20–30 seconds or more. This is repeated numerous times throughout the session. When patients report no distress related to the targeted memory, the clinician asks them to think of their preferred positive belief and to focus on the incident, while simultaneously engaging in further sets of eye movements. After several sets, patients generally report increased confidence in this positive belief. The therapist checks the patients’ body sensations. If there are negative sensations, these are processed as above. If there are positive sensations, they are further enhanced. In the closure phase (phase 7), the therapist instructs the patients how they should focus their attention after the session and ask them to keep a weekly log and to write down any related material that may arise. The therapist finally reminds the patients of the self-calming activities that were mastered in phase two. The next session begins with phase eight, i.e. reviewing the work done and checking whether results are maintained from the previous session. The first relevant result of the study was the ability to perform an on-line monitoring of the cortical firing occurring during EMDR therapy by means of the EEG, more specifically during bilateral ocular stimulation. Following successful EMDR therapy, the main neurobiological finding of the study was the shift of the maximal cortical firing, during both autobiographic script listening and BS, from prefrontal and limbic regions at T0 to fusiform and visual cortex at T1 (Figure 4 and 5, respectively). and a more leftward oriented limbic activation during BS (Figure 3). The latter finding might be related during BS to the guided attempt to encode unelaborated emotional material, activating preferentially left rPFC . The significantly higher activation found in patients during the BS at T0 compared to T1 in rPFC (Figure 5) confirms the leftward differences found during the same phase in patients as compared to controls (Figure 3). 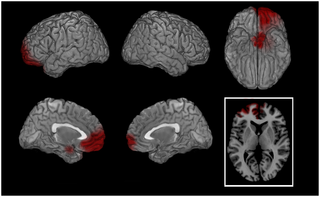 Prefrontal activation is associated with evaluation of self-generated material  being anterior cingulate cortex the point of integration of emotional information involved in the regulation of affect  as well as a key substrate of conscious emotional experience monitoring information with affective consequences. Rostral PFC as part of the limbic system is thought to be involved in processes concerning the emotional value of incoming information and to be critically implicated in functions altered in psychic trauma response. Its activation upon emotional induction is considered to represent the neurobiological correlate of the affective valence of the stimulus . Moreover, episodic memory retrieval is known to activate PFC , and a close relationship between autobiographical/episodic memory, the self and the involvement of PFC was described . PFC has also been found to be activated while suppressing unwanted memories  and was found by near infrared spectroscopy to be activated during trauma recall before EMDR therapy . All these functions may be exaggerated in patients before EMDR therapy in which the self-referential emotional contents cause an activation in rPFC larger than in normal individuals or in the patients after having processed the traumatic event. One relevant neurobiological effect of EMDR in patients was represented by the differences found between the cortical activation at T0 as compared to T1 during script listening (Figure 4). In this comparison we found at T1 a significant increase of the EEG signal in right FG as well as in right visual cortex (VC). These changes suggest a better cognitive and sensorial (visual) processing of the traumatic event during the autobiographic reliving after successful EMDR therapy with a preferential activation moving from the emotional fronto-limbic cortex (at T0) towards the associative temporo-occipital cortex (at T1). Once the memory retention of the traumatic event can move from an implicit subcortical to an explicit status different cortical regions participate in processing the experience. On the other hand FG is implicated in the explicit representation of faces, words and abstract thoughts  and its prevalent activation after successful EMDR therapy might be associated with an elaboration at higher cognitive level of the images related to the event. The loss of functional connectivity between left VC and FG found in patients at T1 as compared to T0 during the script listening was associated with the disappearance of symptoms and speaks in favor of disconnection of a pathological visual network after successful EMDR therapy. At this stage, as an effect of successful trauma elaboration, the visual images of the event are processed and stored in primary and associative visual cortex and likely decoupled from the emotional memory of faces and bodies linked to the event, typically processed by FG. Moreover, affectively valenced stimuli were shown to prompt event-related synchronization in posterior brain regions in the theta frequency band . Such synchronization might have disappeared once the images of the traumatic event lost their emotional meaning. The findings of decreased pair-wise interactions between PFC, ACC and PCC found in patients as compared to controls during BS show that the functional connectivity during trauma relieving and involving three important frontal regions was not present in patients. This underscores the pathological nature of the changes occurring in post-traumatic conditions in the limbic system and the central role of the latter in properly processing negative autobiographical events. Our findings point to a highly significant activation shift following EMDR therapy from limbic regions with high emotional valence to cortical regions with higher cognitive and associative valence. This suggests a strong neurobiological rationale of EMDR, thus supporting its efficacy as an evidence- based treatment for trauma. 1. Pagani, M., Di Lorenzo, G., Verardo, A. R., Nicolais, G., Monaco, L., Lauretti, G., … & Siracusano, A. (2012). Neurobiological correlates of EMDR monitoring–an EEG study.